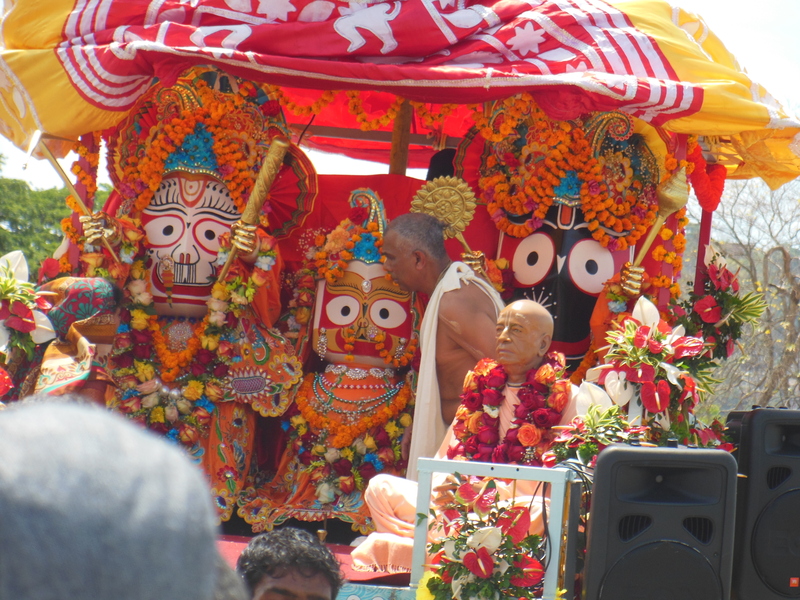 Lord Jagannatha Rolls Through Town………..Twice! 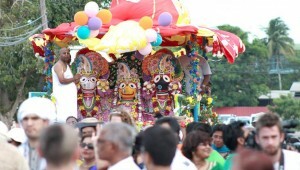 Our 2014 Ratha Yatra festivals got off to a flying start on Thursday 15th May with Lord Jagannatha rolling down Frederick Street accompanied by the resounding chanting of the Holy Names of Lord Krishna. 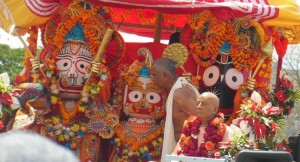 Their Lordships Jaganatha, Baladeva and Subhadra Devi were splendidly dressed and the devotees swiftly took hold of the rope that was attached to the beautifully decorated chariot. Accompanied by kirtan by Bala Krishna Prabhu, His Grace Agni Dev Prabhu, His Grace Gopta Das and Visvarupa Das, the chariot journeyed from the Queen’s Park Savannah through Frederick Street and then onto the Brian Lara Promenade. Throughout the parade His Holiness Guru Prasad Swami continued to encourage devotees to chant and dance in the ecstatic kirtan. 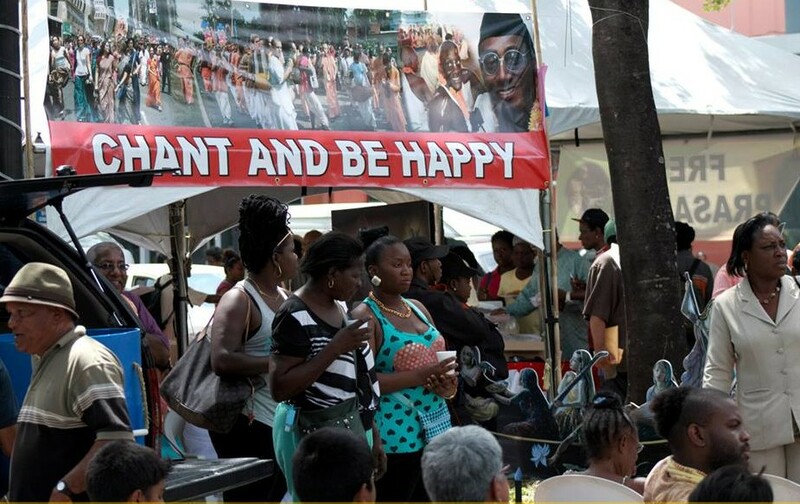 This great festival grabbed the attention of many a passerby as devotees distributed Prasadam(sanctified vegetarian food stuffs) to almost every onlooker. Dragon dancers were also part of the show until final Artik was performed to the deities. 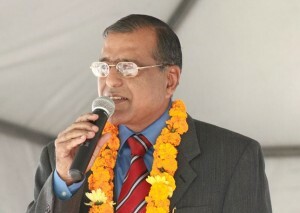 The Indian High Commissioner, His Grace Gauri Shankar Gupta as also present to bring greetings on behalf of the Indian High Commission. 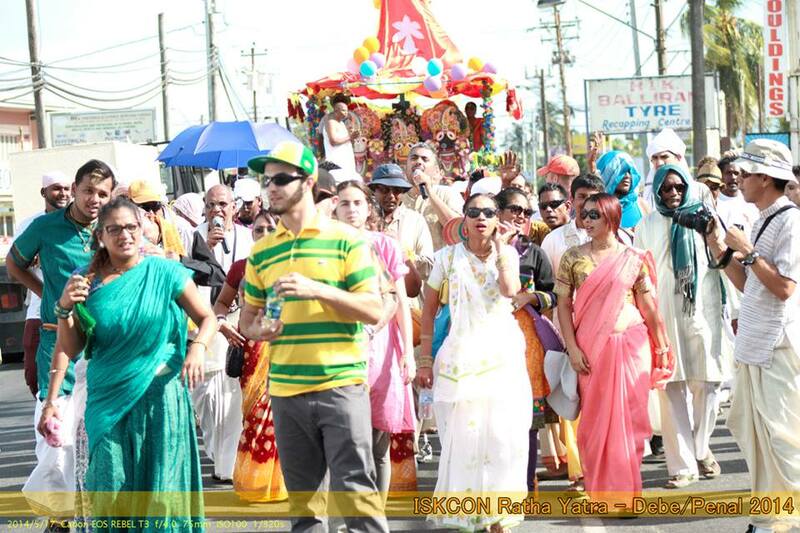 This, the 5th consecutive year of Ratha Yatra was indeed a grand success thanks to Baladev Prabhu and all the other devotees. As the saying goes, when it’s nice we should do it twice. 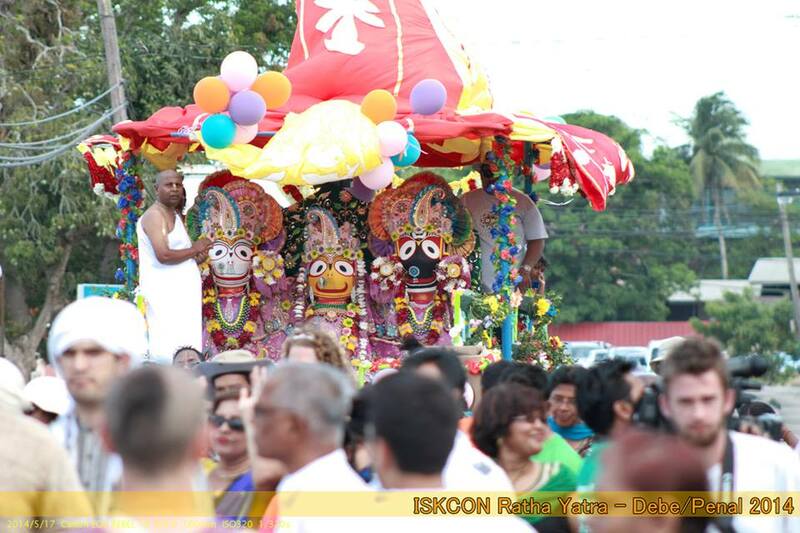 and so it was that Lord Jagannatha spread His mercy is South Trinidad on Saturday 17th May 2014 with the second installation of Ratha Yatra 2014.The procession commenced at the Bakal recreation ground near Gopi Trace in Penal and the chariots looked as majestic as ever carrying Their Lordships Jaganatha , Baladeva, Subhadra Devi , as well as Sri Sri Gaura Nitai and His Divine Grace A.C. Bhaktivedanta Swami Prabhupada. The parade began around 2p.m. and proceeded towards NAMDEVCO Market, Debe. 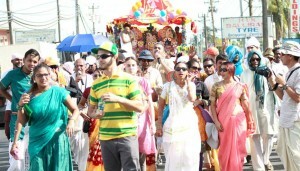 With blissful kirtan beingled by various kirtaniyas, the procession caught the attention of many spectators as devotees danced gracefully throughout. On arrival at the Namdevco Market sight, the stage program commenced with Jaganatha Ashtakam by Paramodara Devi Dasi and kirtan by His Grace Amala Kirtan Prabhu from the USA. 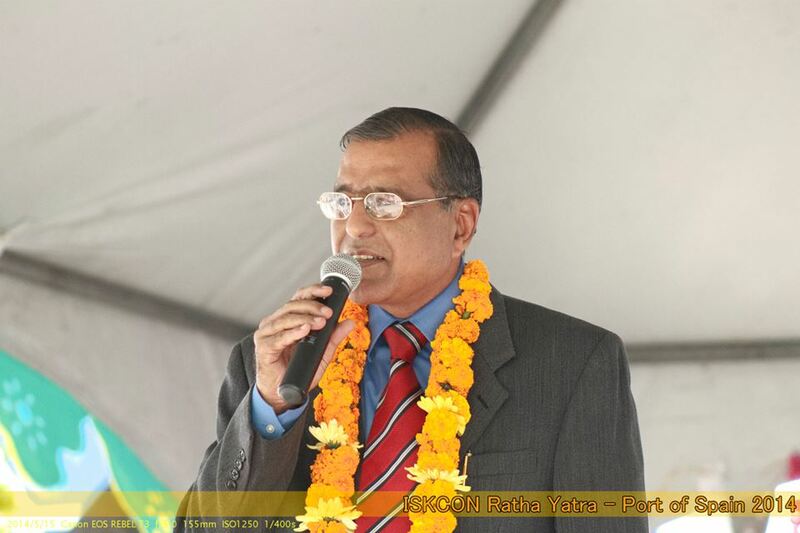 A short message was then delivered by His Holiness Bhakti Prabhupada Damodara Vrata Swami. Kirtan and drama then continued deep into the night while all attendees took part in a delicious feast prepared by the devotees of the South Centre.